Having received their promotional examination results just yesterday, some J1s are undoubtedly in the process of making critical decisions on whether or not to apply to take a H3 (or two) next year. To better inform your decision, Raffles Press has interviewed a number of J2 students on their experiences in their various H3s over the course of 2014, as well as any advice they would like to offer prospective H3 students. In this article, we introduce the various internal H3 courses offered by MOE for your consideration. Do also read our guides to H3 History and some of the Science H3s, as well as our article on whether you should take a H3 at all. 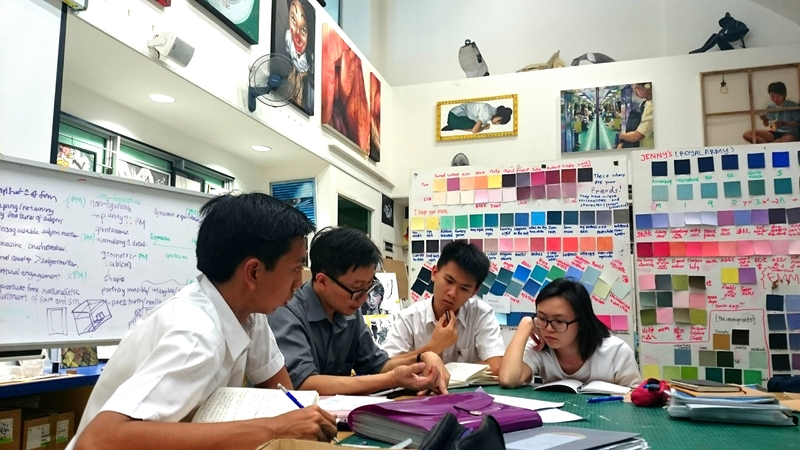 H3 Art students engaging in a discussion with their tutor, Mr. Chia. H3 Literature in English is research-based, and students will thus have to submit an essay of 3000 – 3500 words alongside an evaluative commentary of 800 – 1200 words. As stipulated by the SEAB guidelines, this essay has to be based on a minimum of 3 primary texts. While these tasks may sound daunting, Lim Wei Khai (14A01C) said that if students consider their proposals carefully, they will not find the subsequent textual analysis overly problematic, especially as they do have some leeway to alter their questions even after they have begun to write their actual essays. With regard to the time commitment required, Wei Khai said that students have considerable flexibility in deciding how much time they should allocate to their projects. “The purpose is independence, after all,” he said. If you are worried that you will be unable to hit on a good project idea in time, fret not. Wei Khai advised, “In the down-period between J1 and J2, one could be more inclined to travel and enjoy oneself instead of seriously thinking about what texts to do and how best to frame a question.” He also appreciated how this H3 subject gave him considerable exposure to the rigour of writing papers, particularly since “the closest thing [Singaporeans] have to coursework for our local A Levels (unlike in England) is a number of term papers on topics we have varying interest levels in”. The demands for H3 Music, History, Geography and Literature are similar in that students must produce a research essay of about 3000 words in length on any topic of interest. For H3 Music, possible topics run the gamut from a detailed analysis of recordings, to discussions on the structure of a music work, and to the influence of a composer’s style on other composers. Chow Xiang (14S03C), one of the few H3 Music students in this year’s graduating batch, wrote his essay on the analysis of the form of a piece by Russian composer Scriabin. He made his choice having found the piece to be sufficiently complex and intriguing, and advised prospective students, “If the topic has few grounds for analysis, there would be no point in researching that topic. So a balance between interest and depth has to be found.” After narrowing down their choice of topic, students submit a proposal to Cambridge for approval, and commence research for their initial drafts only after receiving confirmation. Chow Xiang remarked, “This is the difficult part as most of the sources needed are not found in print.” Students are only allowed two official consultations with the RIJC H3 Music teacher, namely Dr Gooi. H3 Art students are required to take 2 hour lessons each week on top of the usual H2 Art lessons, and the course culminates in a 2 hour-long written paper of two essays at the end of the year. These lessons comprise discussions on issues regarding the art world, such as the nature of art, what defines an artwork, or what influences the artist and the art world. The main objective of these discussions is less to obtain an answer, and more to gain a perspective on the situation and build your own opinion. Class sizes tend to be small, and due to the free-flow format of the lessons, favoured by the teacher, Mr Chia, the fruitfulness of each discussion genuinely boils down to students’ level of participation. Copious quantities of weekly readings are also given to supplement these discussions. Elizabeth Khong (14S07C), a H3 Art student, admitted that these are difficult to complete, especially given their complexity, but she conceded that they do “give you a good idea of the key issues and contentions, as well as case studies”. The main topics in the H3 Proteomics syllabus are: Protein Chemistry, Analytical Techniques, Protein Structure and Function, as well as Bioinformatics. While Protein Chemistry is largely an integration of the H2 Biology and Chemistry syllabi, most other topics, such as Bioinformatics (which is about online databases that store information about proteins) and Analytical Techniques (which covers the theory behind the preparation and analysis of protein samples), tackle a greater proportion of extracurricular content – a fact that will interest those who are currently bored by the H2 Biology curriculum. Those who are worried about the stress caused by multiple assessments may find it a consolation to know that H3 Proteomics only involves a single 2.5 hour-long written paper. Quek Rui Tong (14S03B) observed that the unusually small class size (7 people for the 2014 cohort) was highly conducive for learning, explaining, “It was very easy to clarify doubts in class and the teachers were able to pay extra attention to each student.” The large amount of out-of-syllabus content also provided her with ample opportunities to further pursue her interest in Biochemistry. “Now, it is also easier to draw parallels between Biology and Chemistry, as much of what we learn in H3 requires the consolidation and integration of skills and knowledge from both disciplines,” she added. On the flip side, Lazarus Chok (14S03P) pointed out that it may be hard to dedicate sufficient time to the subject. “But if you are genuinely interested in the subject, you will find yourself reading about leucine zippers and zinc fingers during your free time,” he remarked, advising prospective H3 Proteomics students that “a willingness to read beyond the notes given will help tremendously”. Andrew Chia (14A01B) assured students hungering for a challenge that, other than the topic of Globalization, there is little overlap between the H3 and H2 Economics syllabi. “In some regards, H3 can be seen as ‘picking up where H2 leaves off’ (for instance, in using game-theory frameworks to address interdependence amongst oligopoly firms), and in some instances, H3 opens up an entirely new avenue to thinking about certain economic issues (for instance, in the use of principal-agent problems and information asymmetry in assessing why inefficient outcomes arise),” he elaborated. “For those who are dissatisfied by the kinked-demand curve, the H3 theory of the firm is the theory for you!” In spite of the content differences, the assessment format for H3 Economics (2 case studies and 2 essays in one examination) is similar to that for its H2 counterpart.